Spread a thick layer of hummus between two slices of bread and griddle it à la grilled cheese (or put it in a panini press, if you have one). The oil in the hummus will make the bread crispy and flavorful. Stephanie G likes to spread hummus on a flour tortilla, followed by a layer of mashed avocado and topped with a layer of mashed cooked sweet potatoes—and then rolls it all up. Use hummus as the base for a creamy salad dressing like drbabs: Just thin it with a bit of oil and lemon juice or vinegar and drizzle away. It also makes a great base for pasta sauces, says Rebecca Firkser | Spices and Spatulas, especially paired with kalamata olives, cherry tomatoes, and spinach. And you can use it as a pizza topping on a pre-baked crust. Top it with feta, fresh or sun-dried tomatoes, cooked sausage or chicken, olives, and herbs, like charlenecara does. The same would work on a baked potato (like skittles does). Kerry Grisley mixes it with a Japanese mayonnaise (like Kewpie) and serves it with vegetable nori rolls filled with cucumber, carrots, bell peppers, and Japanese-style omelets, and pickled ginger. And Kristen W. maintains that hummus is good on just about any sandwich under the sun. Many members of our community use it instead of (or in addition to!) mustard and mayonnaise on their sandwiches. You can even use hummus to make fritters! Droplet mixes them with breadcrumbs (you could also use cooked grains), cheese, and herbs, forms them into patty shapes, and pan-fries them. Add things to your hummus! Janixes recommends swirling in mashed pumpkin. 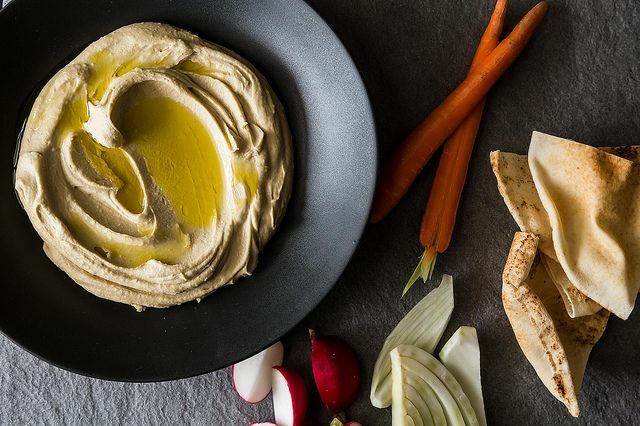 What's your favorite way to eat hummus? Share your ideas (and any strong hummus-related feelings) in the comments. I like to spread out a big scoop of hummus on my plate and use it as a "sauce" under warm, grilled chicken breast. The creamy, buttery texture enriches the leanest cut of chicken turning it into a decadent luxury. Super tasty with extra protein for my slow-carb dieting husband! I've also learned that it makes a delicious crust for baked fish--I spread a layer of it on top of salmon or cod fillets, sprinkled with herbs or panko, and run it under the broiler for 8-10 min. I tend to swirl hummus into pretty much everything I make, come to think of it: fork-smashed sweet potatoes swirled together with dollops of hummus and smoked paprika; scrambled eggs; pureed vegetable soups, etc. Being dairy-free and needing to come up alternatives in a pinch originally opened my eyes to hummus's great versatility in a number of applications! Hummus as a topping for baked potatoes - topped with a fresh grape tomato/cilantro salsa-ish garnish.